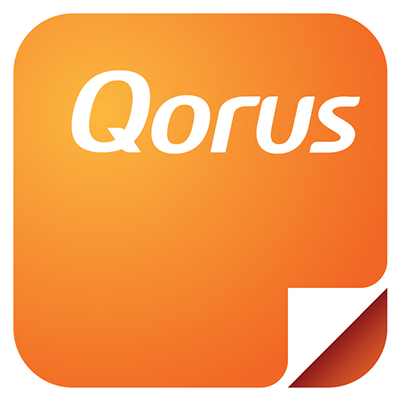 We're pleased to announce that the latest Qorus update is here, introducing a bunch of UI improvements and tweaks, all based on feedback we've received from Qorus users, and aimed at making it quicker and easier to work with the content you've located with Qorus. We've completely redesigned the entire user experience when it comes to working with the content you've located with Qorus, both in the Search pane within the Qorus Add-ins, as well as the Search Pane in the Hub Central dashboard. View thumbnail previews in search results: You can now click to view thumbnail previews for Word, PowerPoint, PDF and image search results directly in the search return, without having to first open the file 'Info' window. New 'Preview' button: There's a new 'Preview' button available for quicker and more intuitive access to the preview window, so you no longer have to click on 'info' to preview a file's contents. New 'More' button: The last button displayed on a search result is the 'More' button. Here you'll find all the other supported content actions for the file you're viewing, like 'Add to Favorites', 'Insert as Refreshable' , or 'View Information'. Contextual menus and buttons: The buttons you see in the Search pane now adapt to both the file type you're working with, and where you are when you're working with that file (either in Hub Central, or in an Office App). This means that in the search pane, you will no longer see any greyed out buttons. You'll only see buttons and menu items for actions that are supported based on the context. More intuitive icons: Many of the icons that appear in the content action menu bar and 'More' menu, have had a mini makeover in an effort to make them more intuitive. We have added new functionality to the file information pop-up window (that displays whenever you click on 'Preview' , 'Info' or 'View Information') to give you more ways to work with your content - all while you're previewing your file, viewing the content's properties, or exploring content usage insights. New content actions menu: In the top right hand side of the window, there's a new menu bar available, packed with content actions that could previously only be accessed from within the search return. This means that you can now download, open or add a file to your favorites, without having to first return to your Qorus Add-in, or close the file information window. 'Insert selection as plain text': This copies the selection you've made, and inserts it into the document, email, or presentation you're working in, in plain text format, in the place where your cursor is currently positioned. If you're familiar with paste options i n Word, this is similar to the 'Keep Text Only' option. 'Insert selection as rich text': Works in the same way as the 'insert selection as plain text' option, but inserts your selected text in rich text format instead of plain text. This is a lot like Word's 'Merge Formatting' option, when pasting content from another document. TIP: If you're working in Word, and would like to insert your selection while retaining all the original formatting, you can right-click with your mouse while in the Selectable Preview window, and then copy and paste it into your documents. Alternatively, you can use the keyboard shortcuts CTRL + C and CTRL V on Windows (CMD + C and CMD + V on Mac). New 'Full Page' Preview: When previewing a file in 'Thumbnail' mode, you can view an enlarged thumbnail image of each page of a document, or each slide in a presentation, as well as browse through the generated thumbnails with the help of the 'previous' and 'next' buttons that appear on either side of the preview. In the top navigation bar in the Qorus Document Builder Add-in, 'Collaborate' has been renamed to 'Assign'. 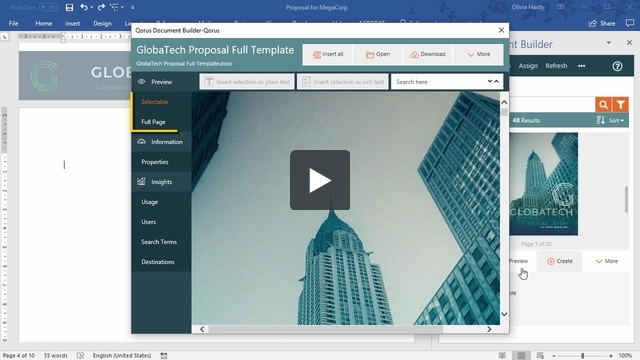 Now you can click on 'Assign' whenever you need to create an assignment in a document. We've done away with the terms 'Pin' and 'Unpin', and replaced these with the more intuitive actions: "Add to favorites" and "Remove from favorites"